If you are lucky enough to have an amazing mom then chances are the new “Thank You, Mom” ad campaign featuring the new video “Strong” will tug at your proverbial heart strings. It shows athletes from around the world recalling moments when their mothers gave them strength and inspiration. With the 2016 Rio Summer Olympics happening in less than 100 days — Procter & Gamble brought in a few of this year’s competitors to New York City (along with their moms) to talk about what inspires them to continually reach for the gold. Our NYC gal Margo was lucky enough to speak with two such future Olympians to find out how they train for big events, deal with nerves and their favorite music to get ready for competition. Gabby Douglas is a tiny (4’11”) spitfire who was among the “Fierce Five” of the U.S. Gymnastics Team and is very eager to head to Rio and earn a few more gold medals to her already impressive collection. Gabby is the first African American woman in Olympic history to become the individual all-around champion on top of all of her other accomplishments. 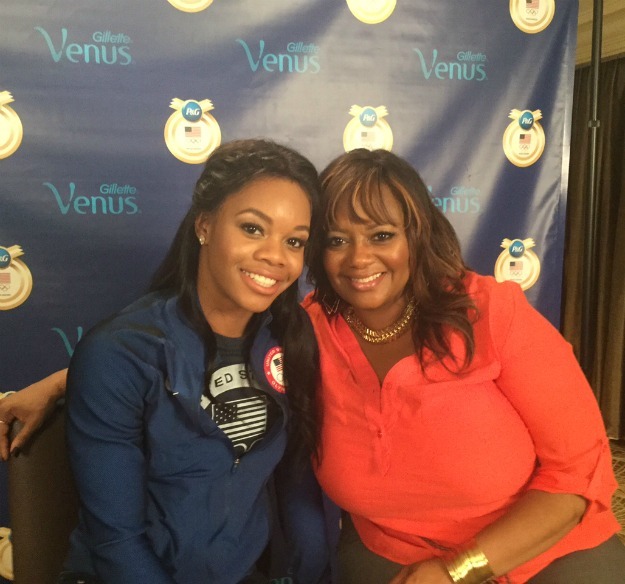 Gabby was also on gold-winning teams at the 2011 and 2015 world championships and had a Lifetime bio-pic about her life produced in 2014 — The Gabby Douglas Story. The spunky athlete picked the Venus razor as her favorite P&G product because it is as flexible as she is and “it’s an innovator like me,” she says enthusiastically. The music that gets her heart pumping before a workout includes Veridia and the Capital Kings. “I’m always playing them,” she says. Gabby also told me that “in a perfect” world she would have her favorite smoothie after every practice but usually just grabs a banana on her way home. Champion swimmer Dana Vollmer is truly a “Momma on a Mission.” The 6’1” athlete with over 30 medals and a world record under her belt is ready to take another shot at winning the gold after taking time off to have her son in March 2015. She calls herself a “Pampers Athlete” because of how often she changes diapers in between training sessions! When Dana began her post-natal workouts she felt as if she was starting from zero with her hips in particular being far looser than before. She used stability exercises to get her body back in shape and feels better now than ever before and wants all new moms to know that it is possible to regain and retrain your body after giving birth. In the past Dana suffered from nerves and anxiety before important meets (she just missed her chance to compete in the 2008 Olympic Games), but says once she realized that her son will most likely never know her as a swimmer — it made training and competition so much easier. “Having him in my life has given me so much more perspective on the Olympics,” she explains.